The Place When we caught wind that Chef Keisuke Takeda is going to open his 12th dining concept (after the likes of Tendon Ginza Itsuki and Ramen Keisuke Kani King), we were surprised at how fast his group has expanded over the past few years. The latest concept to hit our shores is Teppanyaki Hamburg Nihonbashi Keisuke Bettei located along Peck Seah Street in Tanjong Pagar. The casual dining restaurant boasts a 66 pax seating capacity, with an open kitchen concept and a few private capsules. As for the focus of this latest concept, it’s easy to tell from its name – ‘Japanese Hamburg Steak’. The Food If anything, there is almost no dilemma of deciding what to have here. You won’t be spoilt for choices for sure, as it is only between the Keisuke Prime Beef Hamburg Set (S$18.80) or the Triple Cheese Prime Beef Hamburg Set (S$20.80). One of the main draw is that with every set, you can enjoy unlimited flow of eggs (think Scrambled, Sunny Side-Up, Japanese omelette style), and also the salad station with more than twenty varieties on a rotating basis. Some of the salad items we spotted include the pasta salad with tuna and eggplant, simmered pumpkin and cha soba salad. There is a minimum order for every diner, think of it as a “semi-buffet” meal. 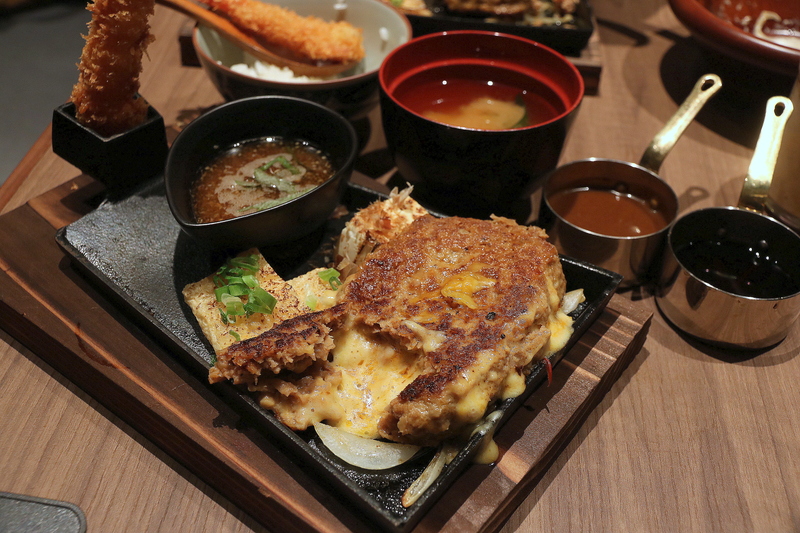 Back to the burgs, the Keisuke Prime Beef Hamburg Set consists of the 150g prime US beef shoulder, served on a hot plate alongside with a fried ebi, fried beancurd and tofu with bonito flakes. The beef patty itself was tasty, though there is also the option of having it along with one of the sauces available – the Keisuke original sweet and spicy sauce, Demi-glace, Oroshi ponzu or Teriyaki sauce. While the set may not look substantial at first glance, our tip is to avoid having too much from the salad and egg stations before the meats are served! Rants Stay away from this restaurant if you don’t take beef. The lack of options is a paradox indeed. Will I Return Again? After trying this Hamburg concept, we can’t help but feel amazed by the wide range of Japanese cuisines the Keisuke Group has introduced to our food scene the past few years. That begs the question of what’s next for the group, we can’t wait. At Teppanyaki Hamburg Nihonbashi Keisuke Bettei, this must be one of the most value for money dining concept to open in a while.